Clemson Girl: Cutie Pa Tutus Giveaway Winner! Cutie Pa Tutus Giveaway Winner! Who's excited about the game this Saturday? Me, me, me. Who's excited about today's giveaway? A lot of you! 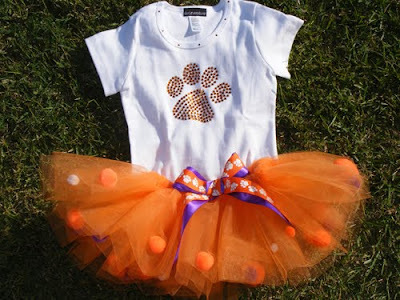 Today one lucky Clemson Girl reader is going to win this adorable rhinestone tiger paw t-shirt and a matching orange and purple tutu for the little Clemson Girl in their life. Special thanks to Clemson Girl sponsor Cutie Pa Tutus for offering this too-cute-for-words giveaway. If you haven't gotten your little one's Halloween costume yet, you HAVE to see the beyond adorable Halloween tutu costumes that Cutie Pa Tutus sells. And don't forget, Clemson Girl readers get 20% off on any regular priced item on Cutie Pa Tutu for the next two weeks -- just enter coupon code GoTigers2011 at checkout. So...let's get to the main event...the giveaway winner! Congrats Shakeeta! Please email us at clemsongirlblog@gmail.com to claim your prize. Stay tuned to the blog tomorrow for a preview and prediction of this weekend's game from Nikki our sports bloggess and a giveaway from Clemson Girl sponsor Entourage!